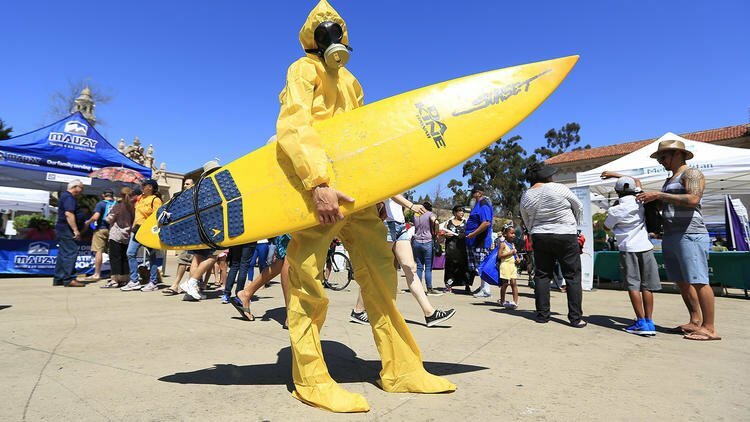 Public Watchdogs’ HazMat Surfer was featured on the front page of the San Diego Union Tribune’s Earth Day 2018 story on April 22. Public Watchdogs’ wildly popular HazMat Surfer helped draw attention to the problem of the nuclear waste at San Onofre with this front page photograph. Andrew Quella was braving Sunday’s 80-degree heat in a yellow hazmat suit and gas mask to help take the fear out of a more serious topic. As he held a surf board and posed for pictures, Quella and Charles Langley, executive director of the Public Watchdogs advocacy group, educated booth visitors about nuclear waste sitting near the coastline at the San Onofre Nuclear Generating Station. Spent nuclear fuel has been stored at the station, which lies on a fault line, for years. Despite the heat and sweat streaming down his forehead, Quella said he was glad he volunteered for the role. He recently switched to a vegan diet, does all of his grocery shopping at local farmers markets and is attempting to live a zero-waste lifestyle.